Tea Room, but not only! 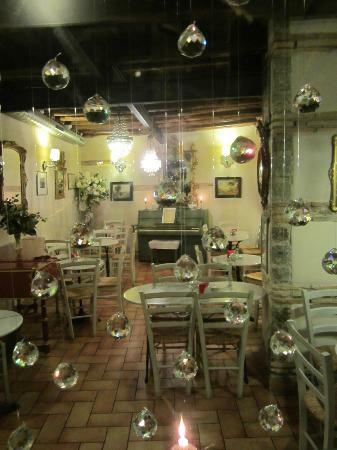 Gian Carlo has created this quaint and delicious little place just in front of the Santa Maria in Vivario Church in Piazza San Rocco. There is a great selection of teas, cakes, aperitifs (including Pimm's in the Summer). Have a Glass of Frascati DOC wine, G&T, Spritz or Prosecco inside or out, admire what is probably the nicest corner of Town. The piano often gets played to guests by Gian Carlo, who is a great musician and has a brilliant history in costume design for the theatre. You can even pick up a bottle of Frascati DOC or DOCG to take with you; maybe to sit and toast on a romantic bench in Piazza Paolo III while you listen to your audio tour. You probably guessed that this place is named after one of Frascati's most important ancient residents, Henry Benedict Stuart, the Cardinal Duke of York. And in fact, it has an olde worlde charm about it. Present your coupon for 10% discount off your purchases.